The Hamas movement said Thursday that President Mahmoud Abbas revealed “dangerous information” in a speech Wednesday addressing the Fatah revolutionary council. In a statement, Hamas added that ousted Fatah leader Muhammad Dahlan was aware beforehand of an Israeli plan to target and kill senior leader of Hamas’ military wing Sheikh Salah Shehadah. 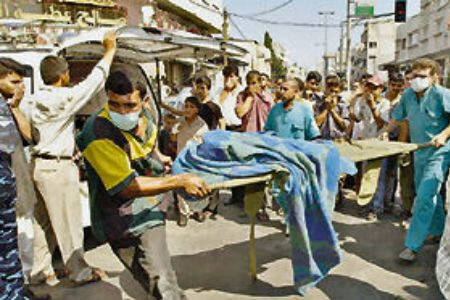 Shehadah was killed in July 2002, after an Israeli F16 plane fired a 1-ton bomb at a building in Gaza City he was hiding in. At least 15 civilians were killed in the attack and more than 100 others were injured. 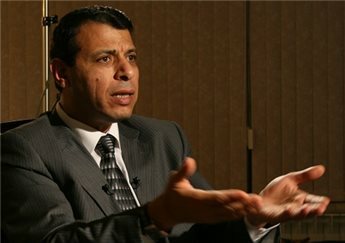 In a speech in front of the Fatah council, Abbas accused Dahlan of being involved in the murder of six outstanding Palestinian leaders including Shehadah of Hamas. 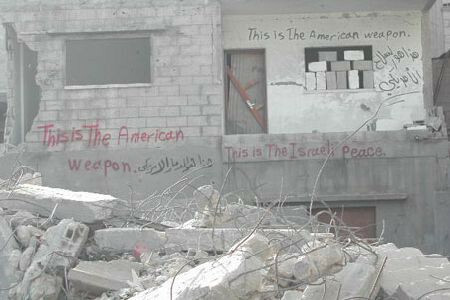 "This is the American weapon, this is the Israeli peace." Graffiti in the al-Daraj neighborhood of Gaza City, after Israel assassinated Salah Shehade by dropping an American one-ton precision "smart bomb" on an apartment building there. No criminal offense has been committed by the Israeli military over the assassination of a senior Hamas leader and more than a dozen other Palestinians, Tel Aviv says. The probe -- carried out by Israel -- has concluded that the Israeli army acted on faulty intelligence and the assassinations were justified and did not constitute a criminal act. 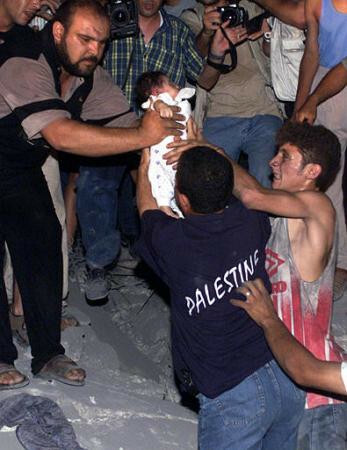 On July 22, 2002, Israel dropped a one-ton bomb on a house in Gaza City, killing Hamas leader Salah Shehade along with 16 other Palestinians, including nine children. The assassinations led to widespread international condemnation at that time. The report, published on Sunday, also cleared all those involved in the assassination and said that there is no room for legal proceedings against them, AP reported. The classified report effectively ruled out any further action against troops over the dropping of a one-ton bomb. Rights activists accuse Israel of taking too few steps to avoid Palestinian civilian casualties when ordering military operations. Foreign and domestic critics said that the 2002 attack at the height of the Palestinian uprising, in which thousands died, is a clear example of Israeli indifference toward Palestinian civilians. Similar charges were leveled after the Gaza war two years ago in which some 1,400 Palestinians were killed by the Israeli attacks and inflicted a damage of above $1.6 billion on the territory's economy. 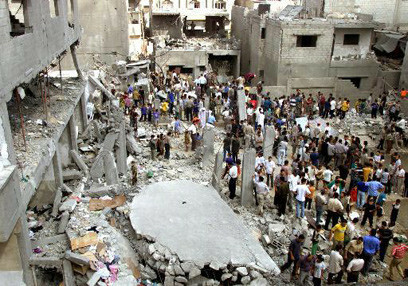 Human rights groups have also criticized the international community for its silence on the siege on Gaza and the 22-day Israeli war in December 2008. 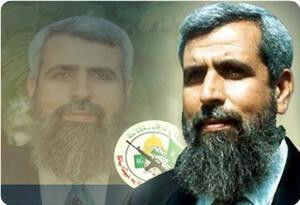 Israel assassinated Hamas top commander Salah Shehadeh in an air raid in July 2002. Hamas has condemned a Tel Aviv inquiry that cleared the Israeli military of any wrongdoing over a 2002 raid that killed a leader of the Palestinian movement and sixteen others, nine of them children. The probe's findings are "a shameless affront to the feelings of the Palestinian people and an official endorsement of crimes and the practice of terrorism," Hamas representative Fawzi Barhum said Monday. 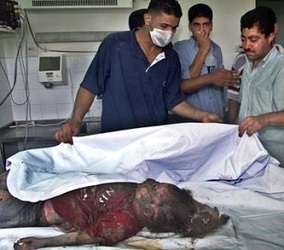 In July 2002, an Israeli F-16 dropped a one-tone bomb on the home of Salah Shehadeh, the head of Hamas's military wing, in Gaza City, killing him and sixteen others. A committee was appointed by former Prime Minister Ehud Olmert in 2008 to investigate the attack. The commission of inquiry handed its report to Prime Minister Benjamin Netanyahu on Sunday. It said that the high civilian death toll was the result of a chain of intelligence failures and concluded that no "criminal offence" had been committed. The report, authored by retired Supreme Court judge Tova Strasberg-Cohen, said the decision to kill Shehadeh was justified. "An examination of the operation according to the rules of Israeli and international law unequivocally removes any suspicion that a criminal offence was committed by any of those involved in the operation," it said. The report also said those who planned the operation were unaware that so many civilians were present because of "incomplete, unfocused and inconsistent intelligence information." The commission recommended no legal sanction against any of the decision-makers. The Gaza-based Palestinian Center for Human Rights (PCHR), however, said the attack is classified as a war crime and a crime against humanity. The Hamas Movement strongly denounced the Israeli occupation state for acquitting killers of Al-Qassam leader Salah Shehadeh who was among dozens of children and civilians who were bombed during an aerial attack nine years ago on a residential area in the Gaza Strip. Hamas spokesman Fawzi Barhoum stated on Monday that the Israeli decision to exonerate the perpetrators was an insolent challenge to the Palestinian people's feelings and official encouragement for more crimes and terrorist attacks against the Palestinians. Spokesman Barhoum emphasized that Israel practices systematic state terrorism and always confers legitimacy on its war crimes. "This file and all files of the crimes committed by the Israeli occupation must be referred to the international criminal court and there should be decisions that curb this entity and isolate it internationally as well as the international institutions should impose economic, security, military, and political sanctions on Israel, expose its crimes and support the justice of the Palestinian cause," the spokesman underlined. The Israeli committee, assigned to investigate the operation that led years ago to the killing of Al-Qassam Brigades commander Salah Shehadeh nine and many civilians, said that the bombing of a residential area to kill a wanted person was a legitimate target. The committee stated in a report handed to the Israeli premier on Sunday that the Israelis, who carried out this attack, did not commit a crime. It also did not recommend taking any legal action against them, claiming that the killing of innocent people during the attack was not as a result of any disregard for human life but of wrong assessments and inadequate intelligence information. Hamas spokesman Sami Abu Zuhri commented on this Israeli report in a statement to the Palestinian information center (PIC), saying that this report confirmed that Israel legitimizes the indiscriminate and unintentional killing of Palestinians. 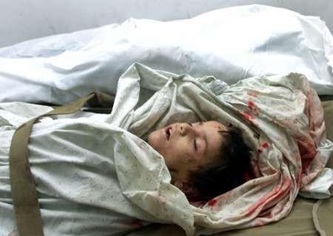 Nine years ago, the Israeli air force carried out a heinous crime in Al-Darj neighborhood in Gaza city when its airforce dropped a one ton bomb at an apartment building killing 17 Palestinians and injuring dozens of them. In another incident, the Hebrew radio said on Sunday that the Israeli fact-finding committee of Turkel that was formed last year to probe the deadly attack on Freedom Flotilla aid convoy summoned the attorney general Yehuda Weinstein for interrogation. Weinstein was informed that he must appear before Turkel committee next month to respond to violations of international law and accusations against him of committing war crimes and crimes against humanity. In report submitted to PM, inquiry commission says 2002 attack in Gaza on top Hamas figure who posed certain, immediate and significant threat to Israels population was imperative; difficult collateral consequences of strike, in which uninvolved civilians were killed, became clear in hindsight. MK Tibi: Assassins should be prosecuted. A report submitted to Prime Minister Benjamin Netanyahu on Sunday determined that the targeted killing of senior Hamas figure Salah Shehadeh on July 22, 2002 was imperative as he posed a certain, immediate and significant threat to Israeli citizens. The Special Investigatory Commission concluded that Shehadeh`s terrorist activity categorized him "a civilian taking a direct part in hostilities at that time" and that his classification by the Shin Bet as a target was professional, based on concrete information and in accordance with the principles of Israeli and international law. Therefore, the committee said, the strike against Shehadeh, "which was intended to terminate his deadly activity, was a legitimate targeted killing". The commission further concluded that the difficult collateral consequences of the strike against Shehadeh, in which 13 uninvolved civilians, mostly women and children, were killed and many others injured, became clear in hindsight to most of the senior officials involved in the planning and implementation of the operation. The officials, according to the committee, stated that had they foreseen in real-time the scope and gravity of the collateral damage which actually resulted, the operation would not have been carried out. "The said consequence was unintended, undesired and unforeseen. It did not stem from disregard or indifference to human lives," the committee determined. During the operation, a one-ton bomb was dropped on the house in which Shehadeh was staying, killing him, Hamas figure Zahar Natzer, Shehadeh`s wife Layla and his 15-year-old daughter Iman, who were with him in the house. Following the operation, a petition was filed with the High Court of Justice requesting that it order the military advocate general and the attorney general to open a criminal investigation against the air force commander, the chief of general staff, the minister of defense and the prime minister of Israel, in order to determine whether criminal offenses had been committed in the course of the planning and implementation of the operation. In January 2008 then Prime Minister Ehud Olmert appointed a committee comprising three members: Former Military Advocate General Brig. Gen. (res.) Tzvi Inbar (committee chairman), Maj. Gen. (res.) Yitzhak Eitan and Yitzhak Dar. Following the passing of Atty. Inbar on August 31, 2009 Netanyahu appointed retired Supreme Court Justice Tova Strasberg-Cohen as commission chairperson. The committee determined that the targeted killing against Shehadeh was imperative because of the increase and escalation in terrorist attacks since 2000, in a manner which led to a situation of actual war, classified as an "armed conflict". These attacks were carried out mainly by the Hamas movement, to which Shehadeh belonged as one of its senior leaders and head of its Operational Branch. Shehadeh was the driving force behind the Hamas, its ideology and its operations, and was directly involved in the planning and execution of deadly terror attacks, the report said. "This situation necessitated effective, immediate and pinpointed measures to eliminate or at least minimize the attacks. One of the means chosen for this purpose was targeted killings against the leading planners and perpetrators of terrorist attacks," according to the report. "Other alternatives that were considered were not implemented, either because the chances of success were uncertain or because Shehadeh switched houses during the planning stages or because there was too great a risk to Israeli forces or to uninvolved civilians resulting from, inter alia, the difficulties involved in a ground operation in a densely-populated area." The committee also concluded that all those involved in the operation showed "awareness and sensitivity" throughout the entire operation with regards to the risk to uninvolved civilians and the "duty to avoid or minimize it to the extent possible, in line with the principle of proportionality. "In addition, the operation was aborted twice because of the presence of a minor, Shehadeh`s daughter, in the house at the time the strike was planned to have taken place. Notwithstanding all this, a gap arose between what was expected and what actually occurred. The central reason for this gap was incomplete, unfocused and inconsistent intelligence information with regard to the presence of civilians in the structures adjacent to the Shehadeh house (the garage and huts), where most of the civilians died," the report stated. According to the committee, this gap stemmed from "incorrect assessments and mistaken judgment based on an intelligence failure in the collection and transfer of information to the various echelons involved in the points of contact between the different agencies involved, and from a lack of sufficient understanding regarding the uncertainty that was created as a result of this unfocused, inconsistent and incomplete intelligence information which was before the decision-makers. "The appropriate balance between the overall considerations of the decision-makers was disrupted, in a way that led to disproportionate harm to uninvolved civilians." The committee stated that the rules of Israeli and international law "unequivocally remove any suspicion that a criminal offense was committed by any of those involved in the operation, adding that it does not recommend that personal measures be taken against any of those involved in the operation. Shortly after the operation, the committee said, investigations were conducted by the various branches of the security forces, after which "lessons were learned and internalized by the security forces and incorporated both in writing and orally in training, lectures and regulations. Changes were also introduced accordingly in the mechanisms dealing with targeted killing operations. According to the committee, the political echelon "also incorporated lessons learned from the operation and its consequences. Today, the procedure for transferring intelligence information to the political echelon is more organized, and decisions by the security services are more carefully scrutinized. There is awareness regarding initiation of meetings with the heads of the security services and the need to request clarifications as appropriate to ensure that the most independent and well-informed decision is made as necessitated by domestic and foreign policy considerations, particularly with regard to possible harm to uninvolved civilians as a result of targeted killings." 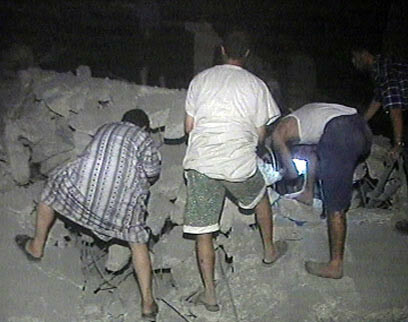 The committee recommended that security forces "incorporate and internalize, on an ongoing basis, the principles and norms of Israeli and international law and the ethical and moral foundations on which they are predicated, particularly in all that relates to harm to uninvolved civilians resulting from a targeted killing against a legitimate target. In addition, the report stated that the "principle of proportionality must be carefully adhered to. A derivative of this principle is that a strike should not be carried out, even if the target is in and of itself legitimate, if the expected harm to uninvolved civilians is excessive in relation to the anticipated military advantage to be derived from the strike, and this in each case according to its circumstances. In this context, maximum caution must be exercised in the selection of the method of striking the target and the type of weapon to be used in the operation. "The required balance was not properly achieved in the targeted killing against Shehadeh. Decisions were made on the basis of flawed, incomplete and inconsistent information which led to misunderstandings, erroneous assessments and mistaken judgment, which resulted in an unforeseen, undesired and unintended outcome," according to the report. Knesset Member Avi Dichter (Kadima) who had served as Shin Bet chief at the time addressed the conclusions and noted that "it is important to state and admit: The assassination succeeded but the operation failed." Dichter added that "Shehadeh`s daughter was the reason why we didn`t approve the attack so long as she was with him. That, more than anything else proves how much consideration and attention was given to avoiding harming the innocent." Meanwhile, MK Ahmad Tibi (United Arab List-Ta`al) also addressed the issue, stating "those responsible for the assassination carried out a war crime and should be prosecuted for killing innocent women and children. The planners and implementers new in advance the price the civilian population would pay.